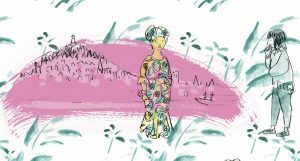 When illustrator, Laura Darling, took a part-time job at the Dundee International Women’s Centre to support her practice as an illustrator, she had no idea that her experience would inspire her first solo exhibition. 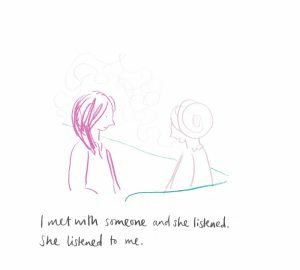 The illustrations on display at Verdant Works are a response to the stories she heard at the centre and a tribute to the women who told them. In Darling’s accompanying statement, she says that although the women and their stories were unique, she found patterns emerging, hence the exhibition title: Patterns of Migration. Almost immediately, a framed print catches my eye: “Where are you FROM?” it asks. The font, and placement of the words on the paper convey the subtly aggressive tone of a seemingly innocent enquiry, and through this simple device, the purpose of the exhibition suggests itself. What does it feel like to be a migrant? On display, there is a collection of prints, book pages and wordless comic pages, wallpaper panels, and in the centre, a large papier-maché plate. The wallpaper panels give Darling the opportunity to play with pattern, literally, but her appealing illustrations and colourful rendering belie the serious intention behind the work. In the piece “There’s so much more I want to say”, the artist imagines the thoughts of two people having a conversation. The indigenous person is unsure of what the migrant understands, whilst the migrant has to translate the words she is hearing, formulate a response and translate again in order to reply. By implication, the ensuing conversation is stilted and unsatisfying for both parties, both of whom have more to say. This pattern was created during a short walk through Dundee where Laura recorded any text that could be read at a glance […] She then flipped the hand-drawn text to show how much extra effort is required when English is not your first language. Notably, this is the only wallpaper in the series which contains no repeated patterns, Darling’s point being that there is not always a second chance to check understanding when learning a new language in an immersive environment. Another print combines the two conflicting statements: “They take our jobs” and “They come here and don’t even work.” The wordless comic, “Back to Square One”, expands the narrative around the subject of work and illustrates the difficulty that even highly-skilled migrant women can have securing jobs when they find that their qualifications are worthless in the UK. The artist uses colour most effectively here: orange suggesting optimism about the future; blue representing the cold reality that the migrant character faces. Darling’s playful pencil illustrations can suggest hope or despair in a few deft strokes. “The Invisible Woman” tells the story of a young woman who is married by arrangement, brought to the UK and brings up her daughters, only to be abandoned by her husband after the girls have left home. The story character represents many isolated and vulnerable migrant women living in the UK, but does Darling’s book help us to understand them? After all, isn’t the invisible woman primarily a victim of her own culture – uneducated, married by arrangement, displaced from her homeland? These things may be true, but Darling’s work highlights the choice that we have to make: do we take responsibility for these women, help them to establish themselves as full members of our society; or, do we leave them lonely and doubly displaced? At the centre of the exhibition space, the papier-maché plate sits like the hub of a wheel. Around its rim are the words: “We all eat from one big plate.” It is the message that I take with me when I leave. I found this an excellent review by Tracy Gow of this artist’s work. Laura Darling’s illustrations seem to deal through her deft strokes, with what are very topical and relevant issues surrounding the many problems and situations we know immigrants face on a daily basis.